Transforming respect from a discretionary value to a global principle. Researching to ensure no copyright infringement before publication of my book, “Connecting the Dots … with The RESPECT PRINCIPLE” revealed the term, The Respect Principle, had also been coined by a California author, James Bauer, but further investigation into his work and book, What Men Really Want, revealed the term’s application is significantly different so there is no copyright infringement. As a result of my recent investigation regarding his and my use of the same phrase, the respect principle, his not-capitalized, The Respect Principle, and mine capitalized, The RESPECT PRINCIPLE, but mine also as part of the title, “Connecting the Dots … with The RESPECT PRINCIPLE” I discovered there is no conflict of interest because as with many other people’s work, James Bauer’s book is an additional educational, inspirational tool, though not a foundational application within the same context, to build higher “RESPECT LEVELS” for one’s self, life … and for the interactions and relationships we have with each other and for that I am grateful … because everybody’s gifts, talents, and abilities are valuable and needed to make our world a better place. The RESPECT SPECIALIST & PEACEMAKER … Freeing “Potential” with Education, Entertainment, and Inspiration! Click on the link below starting Tuesday, January 27, 2015 to DISCOVER … and SUPPORT … the INDIEGOGO crowd funding campaign for the global initiative, Connecting the Dots … with The RESPECT PRINCIPLE … because every child … every person … should know, by their own experience, they are valued … RESPECTED. © All rights reserved 2014. When we have done all we can, it may not seem like anything else can be done. Except maybe for getting worked up with so much emotion that often incapacitates us by driving us to focus on the negative … that whatever it is troubling us is out of our hands so we may as well just be upset about it … lament and complain about it; myself included. But in the past months, with an increasing Respect Level, I have allowed myself to believe in more than myself or even other people. And not just passively believe, but to actually engage in talking with God … not the God of my Catholic upbringing, but of the one I have learned much more about through televangelists such as like Joel Osteen, Joyce Meyer, Robert Stanley, yet also by other authors and books, such as the Conversations with God series and by reading for myself, an amplified Bible. At first, my inquiry of the supernatural focused on the dark side as a rebellious act in my teens to the hypocrisy I observed in traditional religion. Then, my focus turned to new age teachings as an intellectual adult but when they did not satisfy, I reluctantly returned, with several failed attempts, to God and The Bible. Failed because I was ignorant … expecting too much from people, which I have learned they could not possibly deliver anyway. At least, not at the level of support I needed. Still wrapped up in internal conflict and after years of strained relationships in my family because of a multitude of reasons, three and a half years ago, I was forced by circumstances, which I now know were a series of events God used to get me to move back to the area where my dad lived with his second wife and to where my brother had returned years ago when his first wife’s mother was ill and dying. A few years prior to my return I had started to visit my dad and brother, plus my mother and her partner, who live just a half hour away. After leaving my Etobicoke residence of five years, I returned to the place of my birth, Chatham, Ontario while I waited for my heart and head to tell me where to go next … God again, I now know. Five months later, I arrived in Kincardine after Dad’s second wife and my brother revealed the unfolding events of health-related challenges for Dad. Three and a half intense years later with my Dad, much has changed, though not just his health. Our relationship for one. I discovered the boy in the man, the broken-spirit of a young man with shattered dreams, and a life he lived trying to compensate for what never healed … that has cost him dearly in many ways, including his health now. I have been there … long ago as the first child of four … and the past few years as advocate, care manager, personal support, and driver till his illnesses became too much for us humans to bear alone. I also knew eventually my work would take me away from him and the area but I also knew I could not leave with a good, clear conscience until there were resolutions I could live with when I left. Then, a few months ago everything came to an explosive head and Dad was whisked away for a couple of months so specialists could observe and determine what exactly was causing the drama in his, and everyone else’s, life. And that is when I truly began to pray with all my heart for God to fix this … to turn something so horrible into something good … even if that meant taking him from us on earth. Today, God answered my prayer. When I arrived at the hospital for the family conference that included six medical people and me in the same room, plus several people on conference call: two people from the long-term care residence where he had been residing for just over a year, plus Dad’s second wife and Dad’s two Power of Attorneys, my brother and sister, whom till now, has mainly been a recipient of the information I provided to my brother, I witnessed a new calm and peace in Dad I have not seen since my return to town, especially, when viewed in contrast to the state Dad was in Friday after several infected teeth were removed and the level of pain he was in. Today, I knew God had answered my prayer when the doctor explained how he “connected the dots” in a way no one else yet had in the past five, ten or more years. He revealed there are several things happening, and with diligence, has found viable workable solutions for Dad’s needs … that will enable him to move back to his previous residence and that will also make it possible for him to move into the long-term care residence nearest to his family in Kincardine, which was not a realistic solution till now. Ideally, the best physical environment for Dad to move to was Wiarton because of its setting and much more, but with my leaving the area, and even without my leaving, the travelling his wife had to endure has become too taxing on her. Plus, with Dad living in town, she will be able to visit him on her own and more frequently. Plus, if emergencies do arise, my brother who resides in town part time because of his daughter though he works three hours away can more easily deal with what comes next since Dad and his care needs are finally be out of crisis mode. With our sister also now on board with the details from the conference, they will be able to work as a team like my brother and I have these past years. God chose not to take Dad yet, but yesterday he did remove the responsibility from me as the primary care person by providing the right medical care Dad needs while his life continues to wind down … now much more quietly and peacefully … and the opportunity for him to now live close to home in an environment that would have driven him wild and crazy, even just a few months ago … which also means his wife and my brother can now take over more of the responsibility I have carried. Now I will continue on with the pattern my life keeps repeating … putting me in situations that need my inherent ability to see a problem, investigate, study, analyze, before developing what needs to be created to make things better … and at a certain point, usually within a few years, like I am now, I will hand off the project for the ongoing management of the project to those whose inherent ability is to manage rather than do what I do best … all of which to demonstrates the value our uniqueness adds to our quality of life. 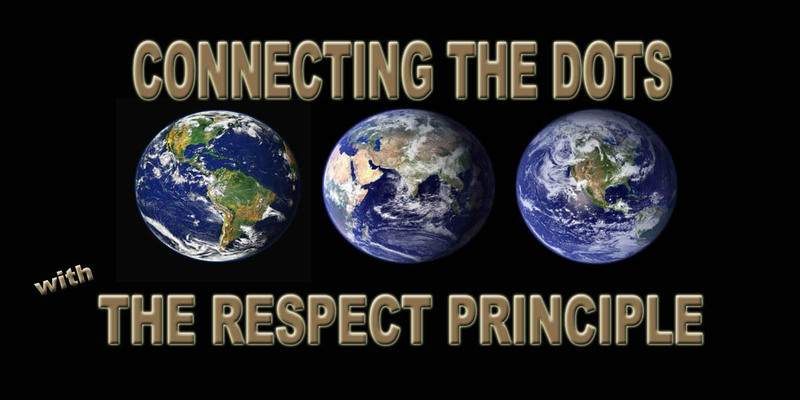 I know the same thing will happen with the dissemination of Connecting the Dots … with The RESPECT PRINCIPLE global initiative. Not that I will give up and walk away from this project. I will not because it is the commitment I have made for the rest of my life, plus it is huge and will exist beyond my existence; however, within a few years, when I have done all I can with what has been accomplished thus far, I trust God to surround the work and me with the team I will hand the ongoing management to … and once again, then I will dive in and immerse myself in the quiet place where the investigation, studying, analyzing, and development happens that will create the next wave of what can be used to help make the world a better place. And when I have done all I can do, or that my team can do … to the supernatural team I will be sure to turn because I have seen what can be done after I have done all I could do. I wish it had not taken me so long to get this, but at least I get it now … and I’m loving the option … and the results! Now, knowing Dad is in the hands of the natural and the supernatural, I now have the time to really dig in and ramp up the INDIEGOGO project for the global initiative and prepare for the upcoming life changes in my own life. Thank you for being who you really are … each and every unique one of you! Dad is still with us, but in such hell, I wish he was not. I spent 8 hours with Dad’s second wife Shirley yesterday … to, in, and from Owen Sound to be with Dad because of the dental work being done on him in the hospital. I realize people are doing their best with what they know, the laws, the resources, and the overall low cultural “Respect Level,” but it isn’t right what’s happening to Dad and people like him … but I have given up on trying to get help from specialized groups … even lawyers. As with a lot of other national and international problems regarding how we treat each other, I know now it’s time to effect change in the broader more logical, practical, and compassionate way that “Connecting the Dots … with The RESPECT PRINCIPLE” provides and by also securing the aid of those also ready to take a stand to generate the higher “RESPECT LEVEL” changes needed … I am so sorry Dad has to suffer as greatly as he is, and as others have or are, but I know one day when he is no longer here with us, but with God, he will know his anguish and pain will not have been in vain because his daughter rose up to the challenge of creating the change … so others would not suffer as he is. God bless you Dad and all of you suffering .. from your diseases and the ignorance of the harm being done to you. For you … all of you … I get up every day and do what I have been gifted … blessed to do to help ease your pain. … BECAUSE every child … every person … should know, by their own experience, they are valued … RESPECTED. The higher our RESPECT LEVEL the more we consider the impact we have on our world. Not treating everyone … family, friends, strangers, and ourselves … as valuable … worthy of respect … makes life more stressful, expensive, counter-productive, and a whole lot less fun! My apologies for time away. I am recovering from a state of shock the past few days in response to the dramatic turn in “healthcare” for our Dad. Considering we live in Canada makes events of the past few weeks even more shocking because we, or at least I, naively thought such things could not possibly happen … here in Canada. There are calls to make to governing agencies tomorrow. I wish Erin Brocovich knew Canadian law the way she does American law so I could get her advice and support for what is being done to Dad without consent of his “voices.” I shudder to think what so many others with Alzheimer’s and dementia are experiencing at the hands of a system that echoes the horror stories of what we’ve been conditioned to believe were no longer existing practices in mental health facilities. Anyway, I had to let you know what’s been up and why this is yet another important reason for the global initiative and book Connecting the Dots … with The RESPECT PRINCIPLE and the complementary communication device, the school play and community event, CHARLES’ CHOICE … because every person … no matter what their age … should be treated humanely … respectfully till their natural demise. Based on Connecting the Dots … with The RESPECT PRINCIPLE’S RESPECT SCALE, we can “connect the dots” with a fresh perspective to see how “free speech,” without a high enough Respect Level, is often used for oppression and in reality, is used as a violent act of aggression … sometimes even as a precursor to physical violence. Making fun of people has consequences … especially people already showing signs of low Respect Levels themselves because of their history, beliefs, and experience plus don’t share our western cultural approval of making fun of people for the fun of it … or for any other reason … adds fuel to always-burning embers … and as we have seen, it only takes one or two who feel maligned and hurt to burst at the seams and unleash the havoc they did in Paris last week … or the havoc unleashed at work places and schools. Standing up for free speech is vital … yet so is standing up for how free speech is used to hurt and harm rather than to promote if not understanding, at least tolerance and peace. The solidarity we need is for valuing … respecting all life and developing new methods of communication and cross-cultural relations that is logical, practical … and compassionate … for everyone … particularly for those hurting the most … those most likely to lash out … it is the only way we will peacefully diminish violence of any kind … globally.